Make the time and let your feet do the walking from Scariff and the East Clare Way. The backdrop of the Sliabh Aughty Mountains provides a beautiful place to go hiking or for a long cycle. In recent years a series of different walks have been marked out in the area. The system of trails is known as The East Clare Way. The trails are well signposted and of differing lengths so that they cater for most people. The East Clare Way is 172km in length and ascends some 3,000metres. Allow an extra 15km for detours to accommodation. It can be comfortably walked in 8 days with stage lengths ranging from 20 to 30kms. From Mountshannon the Way proceeds through Bohatch, Ardeevin and Cappaghabaun towards Scarriff. The long road down the hill offers an excellent view over Lough Derg and Ogonnelloe. Starting at Scarriff the Way passes through the village of Tuamgraney. Leaving Tuamgraney take the first right off the main road and begin the steady climb up into the Slieve Bernagh hills until you reach the townland of Caherhurley. Proceeding along the Way overlooking Ogonnelloe there is some of the most spectacular scenery in the whole of Clare with Lough Derg and its many islands creating a landscape rich in beauty, colour and variety. A sight to behold! The Way descends to the main road near Rinaman Point and veres to the right to re-ascend the hill through Crag Wood. The Way descends the beautiful Feenlea Glen eventually leading to Kay crossroads, an ideal spot to sit and enjoy a picnic before finally walking down into Killaloe. The starting point for the East Clare Way is the heritage town of Killaloe. 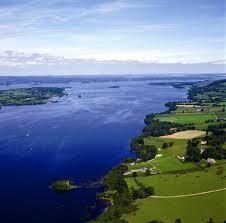 Killaloe is an important tourist centre on Lough Derg, the gateway to Clare. Leaving Killaloe the route ascends via the Gap road. The views along here are magnificent, to the north Moylussa mountain and to the south across the Shannon to Limerick and distant Kerry. The route descends to Kilbane and proceeds through to broadford. Leaving Broadford along the Limerick road the way climbs steeply up the Sallybank road with superb views back to the Slieve Bernaghs. The way descends passing some beautiful oak woodlands, west of Doon lake and on to O’Callaghans Mills. The way continues on to Tulla passing a variety of landscapes including bogland, woodland and pasture land as well as Kilgorry lake nearby. Tulla – the Irish name Tulach meaning a hill – is a hilltop village where St Mochulla founded the original church in 620 AD. Today the walls of the later 18th century structure can be seen. Tulla today is rich in the heritage of traditional music, home of the Tulla Ceile Band. Leaving Tulla and crossing the main Tulla Gort road the Way continues through the forestry track climbing gradually through the area known as Uggoon with views of distant Slieve Bernaghs to the south east and the Shannon estuary to the south west. The mixture of moorland, forestry and scrub in this stretch offer a range of habitats for animals like the Pine Martin, Red Squirrel and badgers as well as a variety of birdlife. Climbing the moorland to Lough Ea on the foothills of Maghera mountain the way goes off to the right crossing bogland, home to a few Red Grouse and eventually descends by an old stone bog road. Continue the way via forestry and up to Ballycrown an area rich in flora including insectivorous Butterwort and Sundew and Cross-leaved heather to mention but a few. Descend the hillside with its beautiful views of Maghera, Knockbeha and Lough Graney. More than 20 different varieties of wild flowers exist in this area especially abundant in Springtime. The Way travels along the valley reaching Liss Cross and the old village of Cloonagroo lies off to the left in the valley. The Way rises via Knockanena descending to the Lough Graney Inn and passes through lowland bog at Doorus. Follow theWay to Dillon’s Wood, views to the right across Lough Graney are magnificent. Follow the Way to Flagmount. This can be a long and fairly strenuous hike and walkers without camping equipment should set out early and well prepared. Perched overlooking Lough Graney is the village of Flagmount. The late 18th century poet Brian Merriman’s poem Cúirt an Mheán Oiche was inspired here. Merriman a local hedge-school master, scandalised the establishment at the time with his social and political satrire on rural Ireland. A commemorative stone to him has been erected nearby at Bunshoon Bridge between Flagmount and Caher. Climbing a steep land alongside O’Mara’s shop to reach the road above. Views back across the lake from here are some of the most spectacular to be found anywhere along the East Clare Way. Climb Knockbeha mountain and left along the Glen road where there’s beautiful views over the Slieve Aughtys and glimpses of distant Lough Derg. Now on the descent follow the Way in an easterly direction to Turkenagh. From here the Way descends through bogland and forestry and for the thirsty traveller you can opt to take the spur to Whitegate or continue the Way to Mountshannon. With it’s fine harbour and modern marina Mountshannon is a picturesque village, a National Tidy Towns winner.